I remember the first time I went to my hubby and told him I wanted to raise chickens. We were living in the city, with neighbors right on top of us and a postage stamp for a backyard. To say the least, he laughed! Being raised in the country where a yard full of chickens was the normal, but raising chickens in the city, was I crazy? I brushed off his apprehension and went about my day, but I had already started to wheels turning in his head. Fast forward five years and we found ourselves in the midst of the homesteading movement, living on 20 acres, and it was now the right time to raise chickens. Even though, I had been raised on a farm with chickens, pigs, goats, cows and geese I had never raised them myself and didn’t know the first place to start. We made a few mistakes and learned a good bit along the way, but I can say we are pretty good chicken raisers now. We have both egg and meat chickens on our farm. The meat chickens come in the spring and the fall and have a completely separate house then our egg chickens who reside with us all year long. I try real hard not to get attached to the meat chickens, but the egg chickens are part of the family and when one of them dies like our King Henry we were heart broken. I hope I can give you a few tips to help start you on your hen house adventures. Never buy your chicks from an over populated chicken farm unless you know what a sick chicken looks like. The first time we bought chicks we found a farmer on Craig’s List. We had no idea what a healthy chicken should look like and brought home ten hens and one rooster. Within two months’ time, they had all died. We had no idea why and when we finally figured it out they had died, and our pen had to be disinfected before we could buy more. The first birds we bought were Rhode Island Reds and the hens were great but the rooster was mean and had an issue with chasing our grandson. That rooster ended up in a stockpot, and my grandson took pleasure in eating that bowl of soup! The Barred Plymouth Rocks we have now are friendly and even eat out of hands. Learn how to tame a mean rooster. As I mentioned earlier, we had to stockpot the first mean rooster we had, but now we know how to tame an aggressive rooster. You have to show him who is boss as soon as he starts showing his true colors. We do this by catching them and holding them for a few minutes every time they act up. You have to be sure to hold his legs with one hand and tuck his wings, so he does not flap around and hurt himself. Always separate broody hens from the regular flock. The first time we had a broody hen that actually sat and hatched eggs the other hens killed all the chicks. Predators are worse in the spring. The first couple flocks we had we let them free range year round. We have now found on our farm that flying predators are worse in the spring, and we now keep our flock in the hen house when we are not outside in the spring. Our best hen protection is our lab, when she is in the yard the flying predators seem to stay away. Fast growing meat chickens are not always the healthiest. The first batch of meat chicken we bought grew so fast they couldn’t support their weight on their legs. It was so sad watching them hobble around the chicken house that we now only but Red Rocket meat chickens. We know it takes longer to raise some breeds out to a good butchering size but they are so much healthier and happier. The longer growth time allows them to free raise for about four weeks before butchering…that makes me feel good about their stay on our farm. 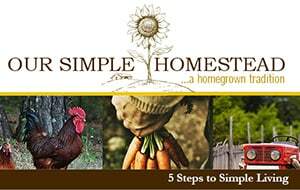 I hope you can learn by some of our mistakes, and if you are thinking about raising chickens of your own I would suggest you hop over to the Farmer’s Almanac, they have some great resources for raising chickens. 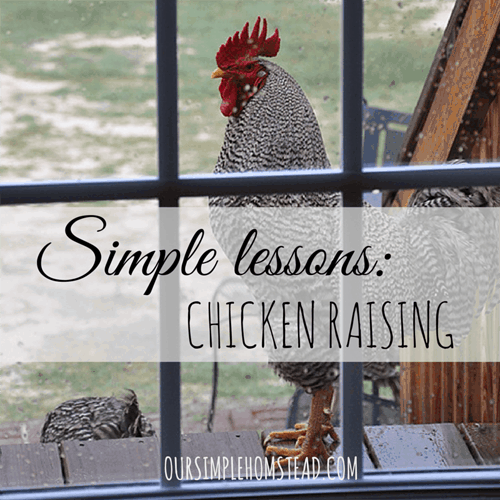 Do you raise chicken? Do you have any hard learned lessons you can share with us? PreviousIs Grape Juice Good For You? We’re thinking of getting chickens. We have a half acre in a subdivision in a semi-rural area. Other people near by have had chickens because we have heard their roosters. We would not have a rooster. We’re thinking we would have a chicken run with chicken wire on top and a coop, of course. We are only thinking about 4 or 5 hens. This post came at a good time because we really know nothing about chickens. Chickens are fun and so easy to raise…you will love them! Your hints are great. We only have egg layers at the moment and they are white leghorn/newhampshire crosses. They lay lovely big eggs. We bought chickens from a battery farm when we first moved here and ended up with mites. We had to treat the pen and then let it lay dormant for 18 months. The chickens were also a hybrid breed and would peck each other. Now we only buy the older breed crosses. We are breeding from these and have a friend who incubates for us and gets 80 to 90 %. She is the chook whisperer!!!. How wonderdul you have someone who is good at hatching eggs. We have tried a few times but never have much luck at it. I think it is our incubator…we need a better one. All very good points! I especially like the meat chicken one. Those fast growing chickens are so sad. Those fast growing meat chicken are so sad to watch struggle walking once they get so old. We just don’t buy them anymore…it is unnatural. Since you do not buy the Cornish x anymore, what breed do you use for meat chickens? Beth we have purchased both the Red Rangers and Pioneer breeds from McMurray’s. They take a little longer to mature but they don’t have the leg problems. My husband and I have talked about raising chickens. Neither of us know much about it. Your post was very informative. I don’t know if we’ll ever do it but it’s nice to know that there are people like you who are doing it and willing to share your advice. Bonnie chickens are the easiest farm animals to raise…it is what we started with years ago. They keep us entertained! We raised our own backyard chickens and it was great. We did have one get broody but we didn’t have any roosters, so that poor girl never did have any babies. It makes me sad that some chickens are bred to be too big for their bodies. That’s obviously not healthy for them- or for us eating them! Thanks for the great post. Chanelle…I always hated to see the chicken grow so fast they couldn’t support their own weight…it just made me sick as well! Tracy – I got online tonight to research chicken trouble shooting and lo and behold your email had a link to a chicken post in it! Could you give me your thoughts? We have thirteen laying hens, all of them are not quite a year old. We average between 9 and 11 eggs a day. But for the last couple of weeks that number has steadily dwindled. With many days only four to six eggs being layed. (We’ve also had a couple of extremely tiny eggs lately) Today we panicked a little because there were only three. They mostly free range, and eat supplemental mash, we’ve checked all the areas they like to spend their days and haven’t found any out and about (they are normally good about laying in their box. We’re quite concerned about the birds and we aren’t sure if we should think “disease,” or “predator” or just a phase? We collect at least once a day but often visit them more than that, so I’m not sure what kind of day time predator it could be… I’ve never seen a snake in or around their coop. Doesn’t mean there aren’t any of course.. Anyways, do you have a guess? Shirley the first thing I would do is shut in your hens for a few days. You need to figure out if you have a production problem or if they are just getting lazy about laying in their boxes. We have to do this every so often and most times they are just getting lazy about where they are laying and forget they need to come into the hen house to lay. Try shutting them in for awhile and then let me know what your egg production looks like. Tracy, thanks for your reply! I’m going to try that and see how it goes! Shirley that is great news! Now that the days are shorter you may see a drop in egg production as well. I was normally getting 8-9 eggs a day and now I am getting 3-4. If you want to get them to lay good again you may want to put a light in their coop to extend the light for them.